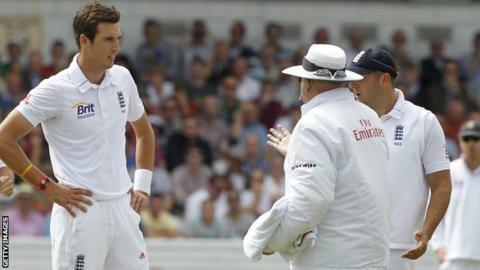 Steven Finn is confident he will soon be at the stage where he is no longer disturbing the stumps when bowling. The England fast bowler has had two international wickets chalked off when the umpire ruled a dead ball after Finn disturbed the bails at the non-striking end during his delivery stride. "It's getting there," he said. "Every day in training I'm working hard on trying to eradicate it. I have been for the last four months. "It's something that's obviously going to have to improve, and it is. "I'm trying different things, and out in the game it's not happening as frequently as it used to. "So I hope there will be a stage where it's completely eradicated." Until he has Finn has been working on a number of options to minimise his chances of disturbing the stumps. One possibility is shortening his run, while he and Saker are also playing close attention to the dimensions of his jump into delivery. Finn added: "I've got the marker, where I jump from, and I'm trying to jump in a straighter line. "But the amount of cricket we play, I haven't had too much time to actually go away and spend a lot of time working on it." While it is an issue that occupies his mind during practice, he says it does not affect his form during competitive matches. "When you're out there on the field, there's only one thing that matters - and that's getting the person out at the other end," said Finn. "When I'm out there in the middle, it's not in my mind at all. "I bowled well in that one-day series in India, and feel as though I've been in good rhythm since I've been over here in New Zealand. "If anything it'll help me to get a little bit quicker, and have a little bit more control." Finn has taken a combined 3-72 in the first two matches of the three-match Twenty20 international series, which is level at at 1-1 following New Zealand's 55-run win on Tuesday.